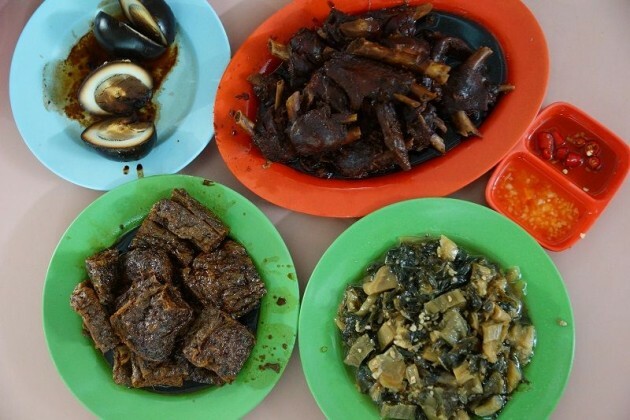 Off the bat, Lau Pa Sat might be on every tourist’s hit list. 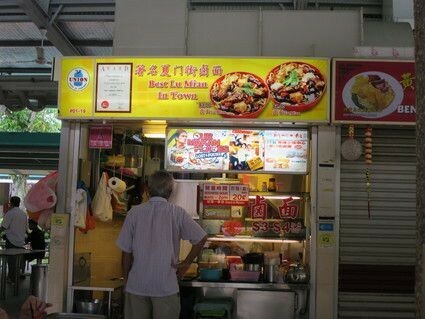 But nothing screams a taste of Singapore unless you’re in a quintessential local market - such as Whampoa Drive Food Centre. 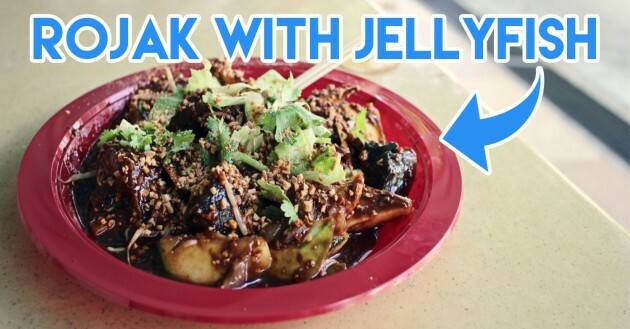 Hidden in the enclaves of Balestier, this underrated hawker centre is one that many are missing out on. A boastful claim such as “Best Lu Mian In Town” works as a double edged sword: it draws crowds but also sets high expectations. Gimmicky or great? First impressions of the Lor Mee ($3) scored brownie points - a generous bowl of mee pok noodles drenched in lor (sauce), laden with ngoh hiang, fish nuggets and braised pork chunks. The braised pork deserves praise, with a golden ratio of jelly-like fat to tender, lean meat. 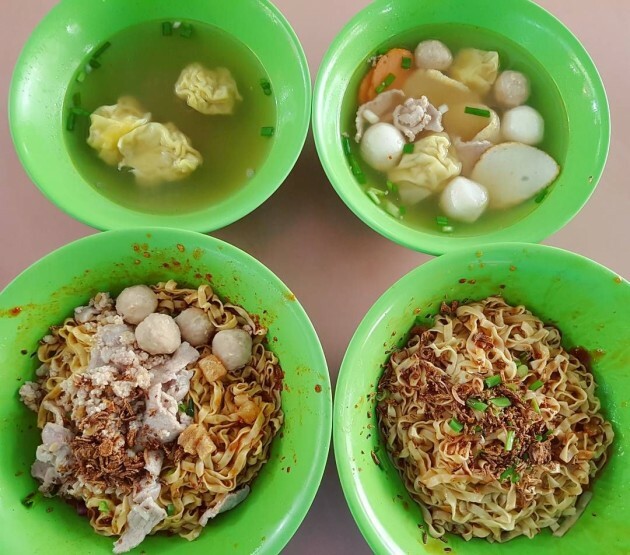 Compared to most lor mees I’ve eaten, the lor of this one is lighter, but holds the elements of the dish well, making the springy mee pok noodles slurpable. 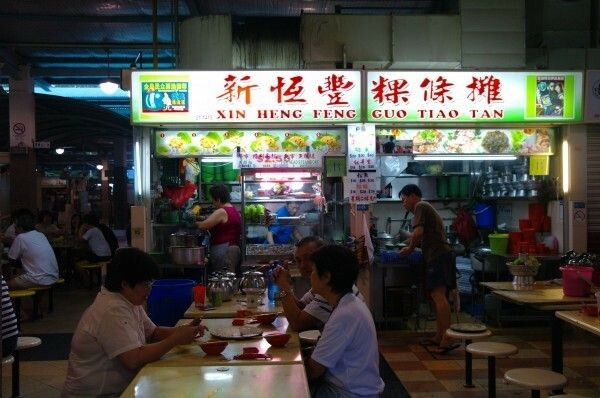 By day, Xin Heng Feng Guo Tiao Tan dishes out mean bowls of Mee Pok ($3), laced with garlic oil, pork lard and fried onion. Nothing fancy - its elements are all down-to-earth, with the usual fishballs, fish cake, minced meat, as well as dumplings, - but it’s strangely addictive for such a simple dish. 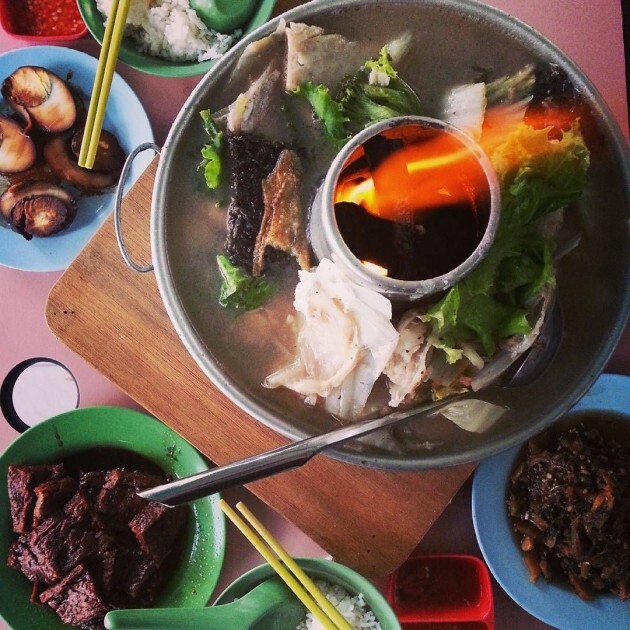 And when night comes, insatiable fans form a beeline for the Fish Steamboat ($20 onwards). 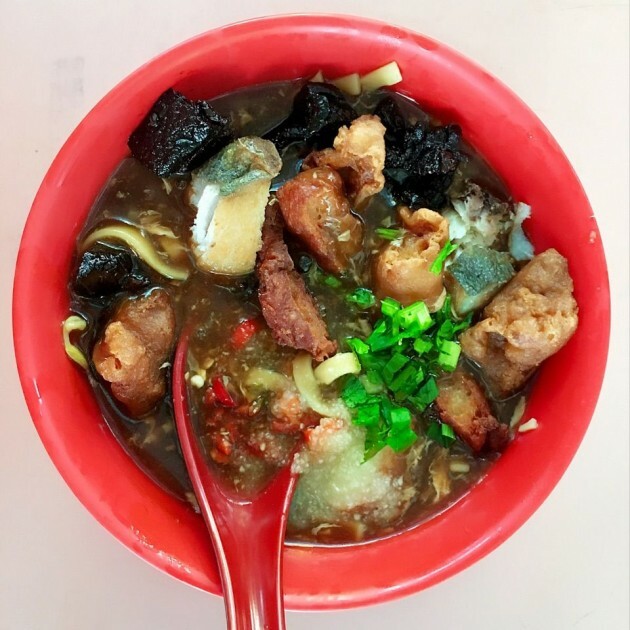 Boiled over charcoal, the steamboat broth bubbles with flavour from the dried plaice and is dressed with generous servings of yam, seaweed, fish slices, and more. 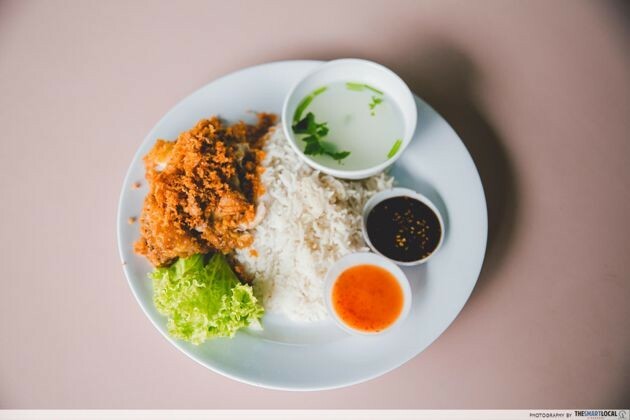 Borrowing the finest of the Chinese and Malay culinary methods, Mat Noh & Rose Authentic Ginger Fried Chicken Rice’s eponymous star dish ($2.50) is a notch above them all - with golden batter coating the ginger infused chicken, and fluffy coconut basmati rice. 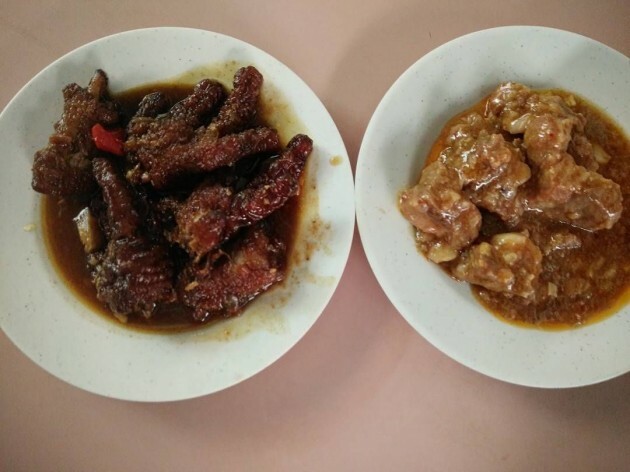 There are also fried garlic bits mixed together with the chicken batter to further bring out the chicken’s flavour. To the brave warriors who think they’ve what it takes to go up against fiery chilli padi, pair your meat with a dip of their specially concocted soy sauce chilli. 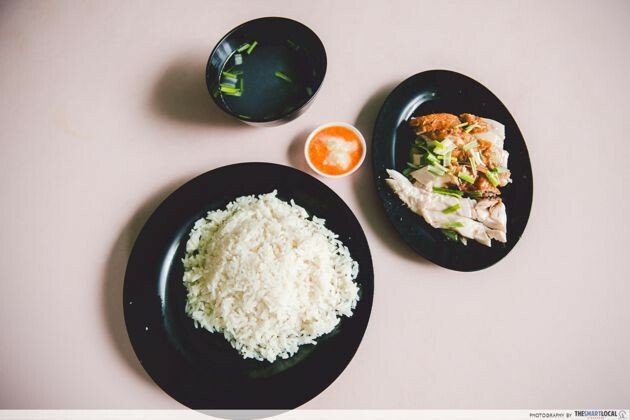 Taking the cake as one of the top 5 chicken rice stalls in Singapore, Nan Xiang Chicken Rice had a crazy queue even at 11am. 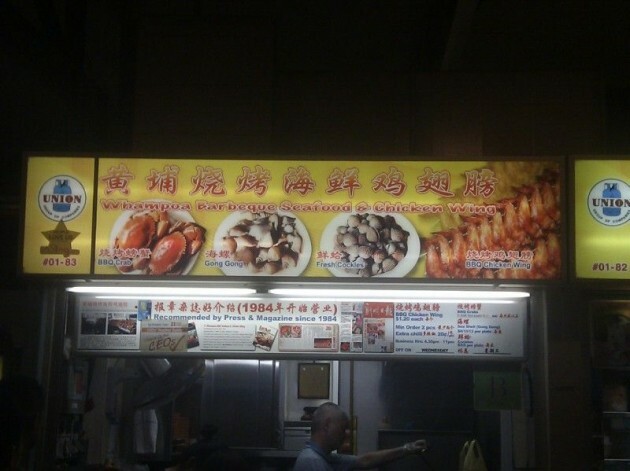 Just for the sake of challenging their highly raved Chicken Rice ($3.50), we ordered breast meat - often despised for its dry, tough texture. But even so, it didn’t disappoint, with its juicy tenderness. But what really sealed the deal for me was the rice - hands down some of the best I’ve tasted so far, even good enough to be eaten even on its own! It’s probably got something to do with their meticulous method of frying the rice before steaming it in broth. 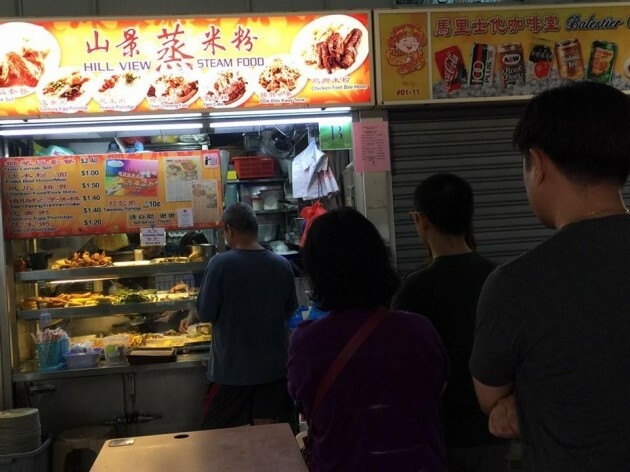 Hill View Steam Food draws fans to its snaking queue from as early as 5am, for breakfast as low as $1. 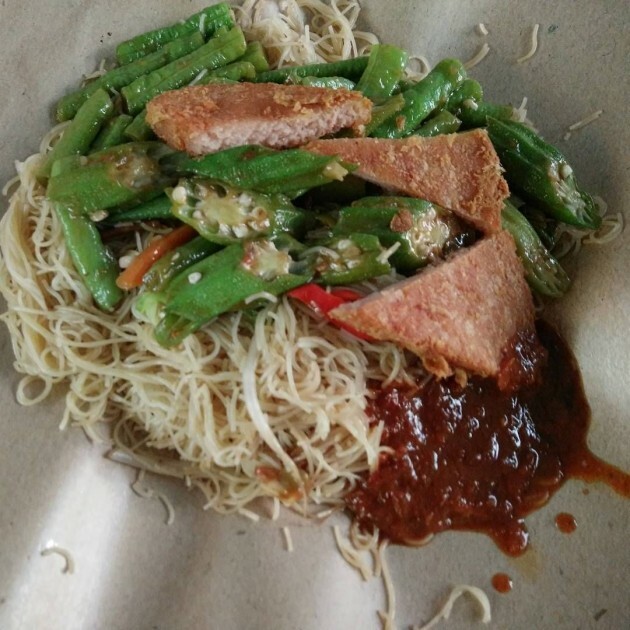 Its humble Fried Bee Hoon ($1) comes in a generous heap, and undergoes the lengthy preparation of being fried first before getting steamed for a springy, non-greasy texture. 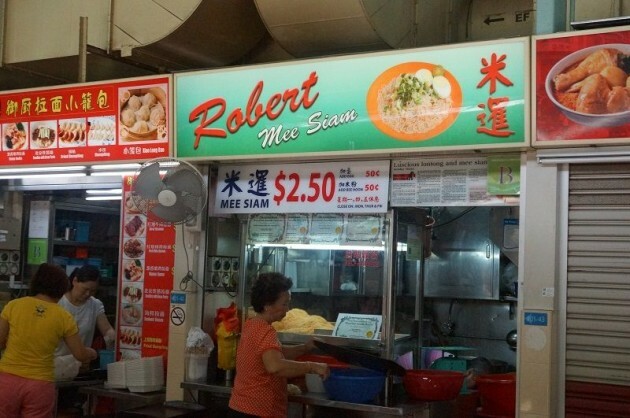 Also worth trying are their Peanut Porridge ($1.20) with other popular traditional dishes like Chicken Feet ($1.50) and Steamed Pork Ribs ($1.50). 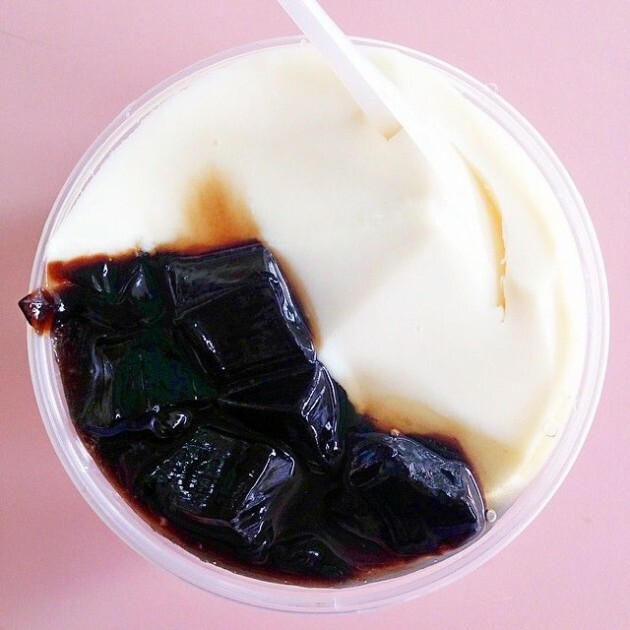 Never cutting corners, Whampoa Soya Bean & Grass Jelly stays firm about making Tau Huey ($1.20) in the most traditional way possible. Unlike the new-age jelly-like tau huey, this one’s silky smooth like tofu and melts in the mouth. 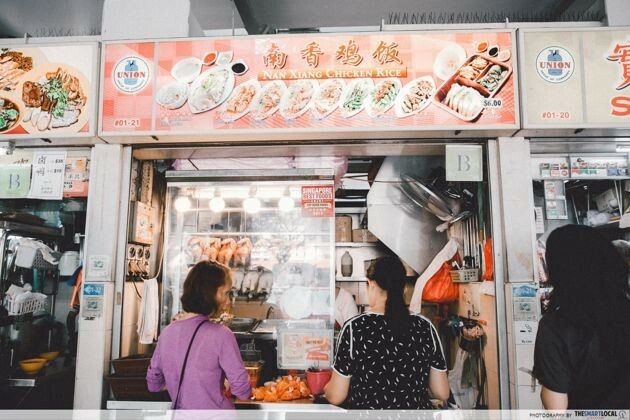 Witness a remarkable one-woman show at Teowchew Kway Tiao Mee: the iron lady ah mah singlehandedly makes fresh fishballs by hand before whipping them into a piping hot bowl of Fishball Noodles (soup/dry) ($3/3.50). 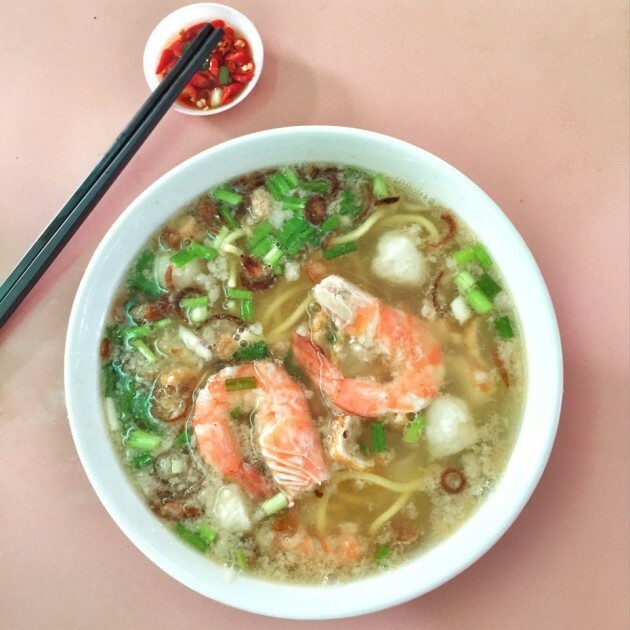 The fishballs are a little larger than marbles - rather small - but they’re crafted with fresh fish meat and simmered in sweet, rich broth. Because her business is so brisk, she can pang gang as early as 10am. 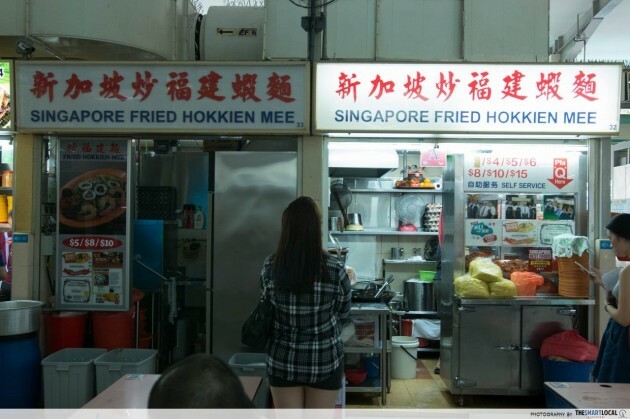 Click here to read about more legendary hawkers that pang gang early, sometimes even before we wake up. 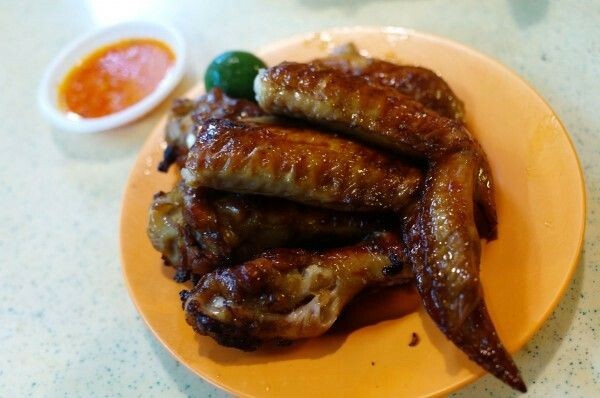 With 20 years of skillful barbecuing under its belt, Whampoa BBQ Seafood & Chicken Wing is a lao jiao at Whampoa Market offering its signature Barbecued Glazed Wings ($1.20/pcs). You can anticipate a thin film of caramelised barbeque sauce to cling onto the chicken skin - and to say it’s crisp would be an understatement. Add a zing of calamansi juice and a dip of the sweet and sour chilli sauce to allow slight chao da flavours to pull through from the tender meat. 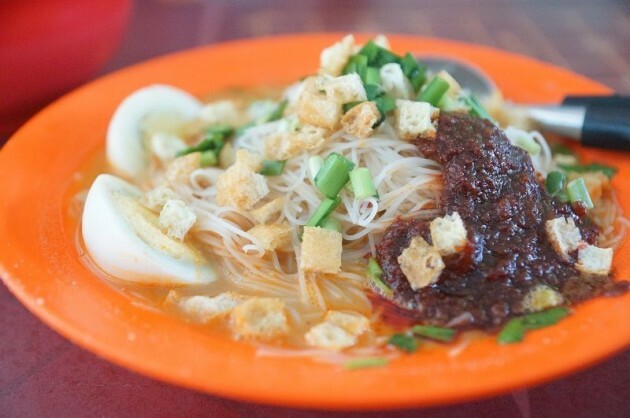 Although Robert Mee Siam Lontong’s Mee Siam ($2.50) doesn’t have the typical red gravy, their pale orange gravy doesn’t pale in comparison. Well-balanced and not too heavy on the assam, the sauce pairs well with the springy bee hoon. Add more lime or chilli for that extra kick! 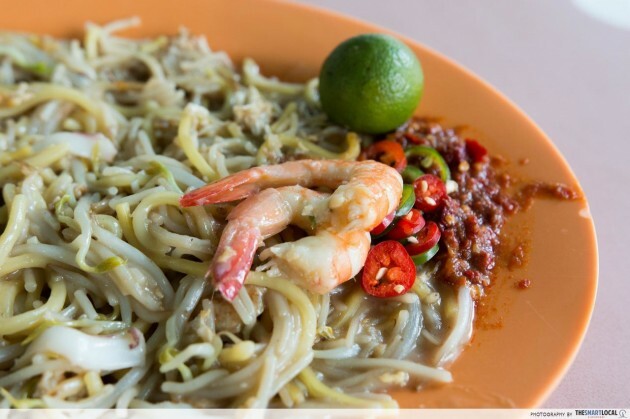 Armed with perfect proportion of slurpy thick bee hoon to springy yellow noodles, Singapore Fried Hokkien Mee ($4/5/6/8/10/15) is drenched in viscous, rich broth. I tasted a tease of hae bee (dried prawns) amongst the noodles, enhancing the flavours of the gravy. 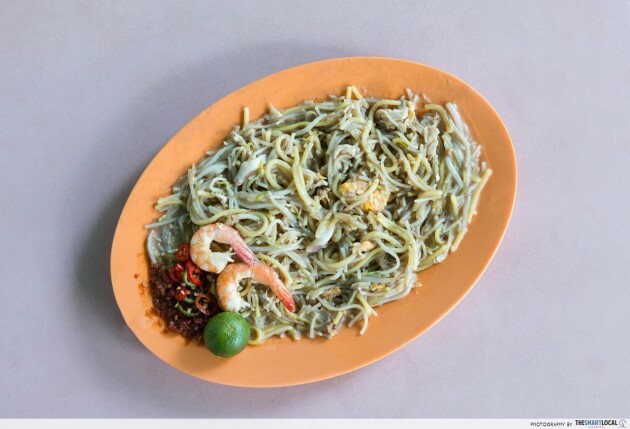 And unlike other hawker stalls, Singapore Fried Hokkien Mee offers a mix of 3 types of chilli - chilli paste, red chili, and green chilli, each packing their own fiery punch. 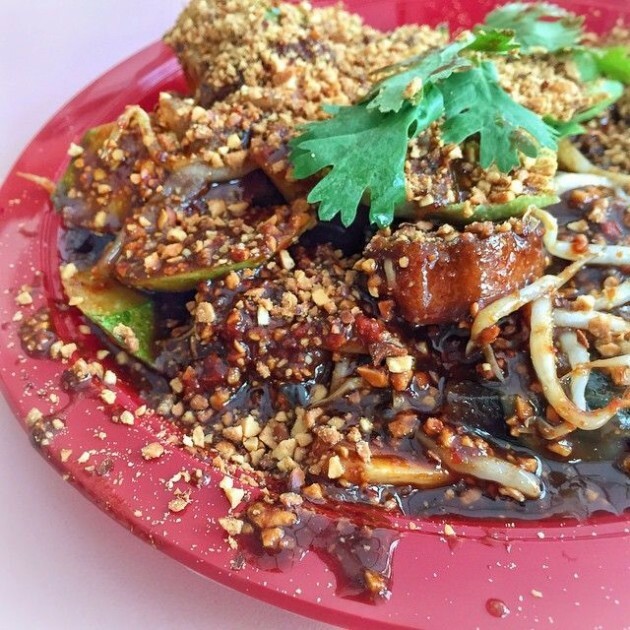 Scoring in the Bib Gourmand category of the Michelin Guide Singapore, Balestier Road Hoover Rojak creates a stir with its luscious gravy - a viscous shrimp sauce laden with crushed peanuts. 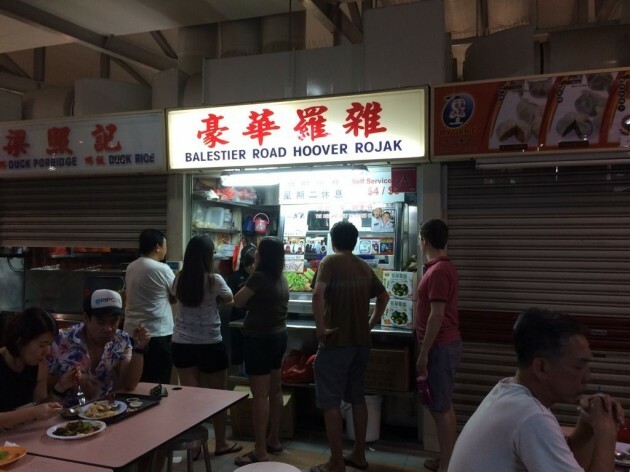 Uncommonly found in regular rojak, the addition of jellyfish makes Balestier Road Hoover Rojak stand out from its competitors. The chewiness of the jellyfish, coupled with pineapple chunks, cucumber and raw mango slices provide the perfect oomph. 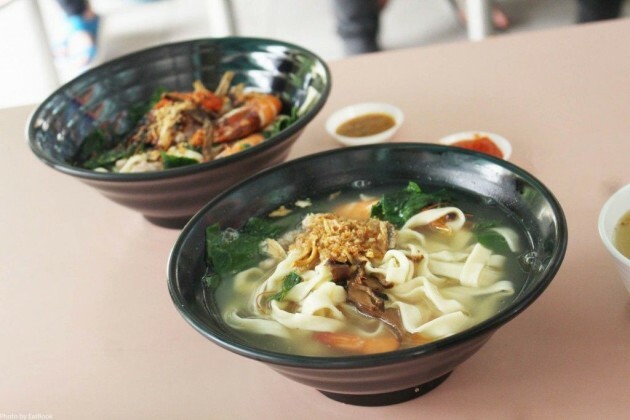 Satisfy your ban mian cravings at China Whampoa Homemade Noodles. Their Noodles (soup/dry) ($4) include gao kee chye instead of the usual chye sim, giving a slight bitterness to your regular veggie crunch. While the usual soupy noodles are comforting on rainy days, the dry version is highly recommended. Tossed in premium dark soy sauce and homemade chilli sauce, each noodle strand is glazed in flavour - super slurpable and shiok. 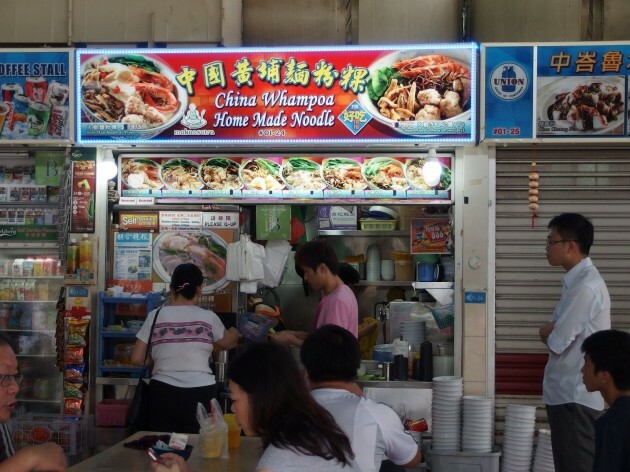 Situated amongst the HDB flats, Whampoa Drive Food Centre is out of plain of sight for a non-Whampoa resident. 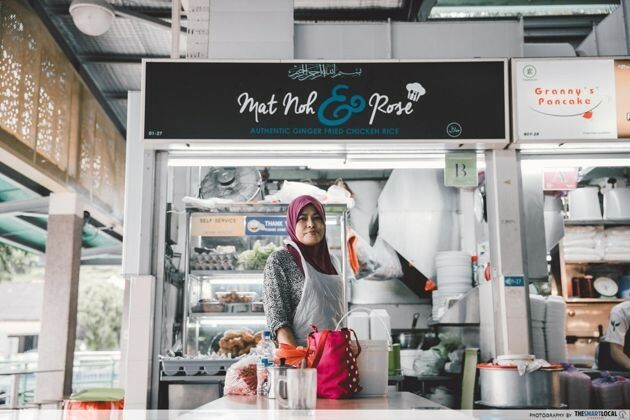 Even if you live at the opposite end of Singapore, it’s worth travelling here for a taste of some of the very best hawker fare.